Kuala Lumpur. 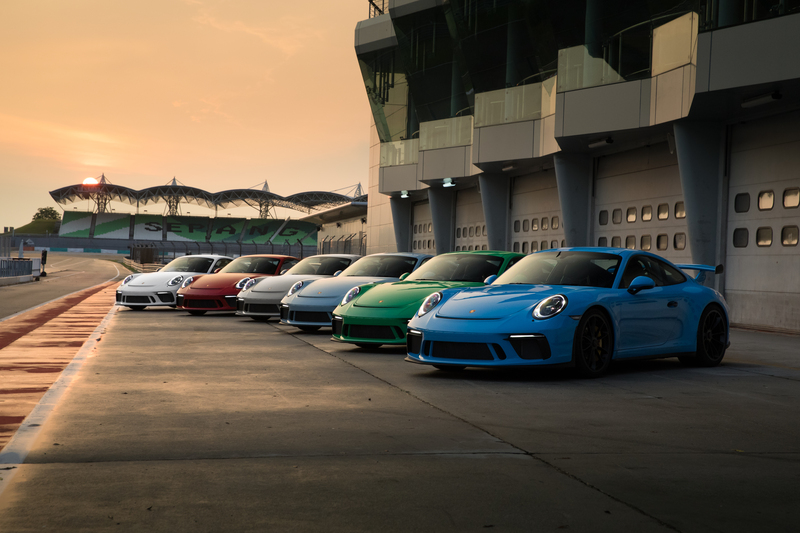 Sime Darby Auto Performance (SDAP), the official importer and distributor of Porsche cars in Malaysia, introduced three unique Porsche 911 GT3 cars commissioned by SDAP exclusively for the Malaysian market - featuring Meissen Blue, Signal Green and Riviera Blue. To showcase the handcraftsmanship capabilities of Porsche Exclusive Manufaktur, these 911 GT3 come with a mixture of high-quality materials, such as a leather interior featuring extended Alcantara detailing. For a unique and sportier appearance, the instrument dials, seat belts and Sport Chrono stop watch are coloured and detailed in Guards Red. The illuminated carbon door sill guards and body-coloured air vents further add exclusivity to the interior. The colour and interior theme is a product of the Porsche Exclusive Manufaktur, a department within Porsche specialising in bespoke modifications for their owners. The owners of these Porsche 911 GT3 cars will be among the exclusive few who have a Porsche that is uniquely their own. “To further enhance our customer experience, we specified three very unique 911 GT3 cars to give owners the chance to own a thoroughbred performance Porsche that is unique to them, guaranteeing even more head-turning moments,” explained Arnt Bayer, Chief Executive Officer of Sime Darby Auto Performance. “The Porsche 911 GT3 is a car that does not need an introduction. Our goal was to provide extreme sportiness, coupled with the fulfilment of individual wishes and requirements. We have accomplished this by offering striking exterior colours in luxurious Alcantara leather, with exclusive interior colour detailing,” he continued. The new 911 GT3 was introduced in Malaysia towards the tail end of 2017 to much fanfare. It has since found a number of enthusiastic owners who not only drive it on the road regularly, but also on specially organised track days that allow them to exploit its full potential. The racetrack is where the new 911 GT3 really comes into its own thanks to its weight-to-power ratio of 3.88 kg/kW (2.86 kg/hp). With seven-speed double-clutch transmission (PDK) as standard, which has been specifically tuned for use in the GT, the two-seater weighs in at 1,430 kg with a full fuel tank and can accelerate from 0 to 100 km/h in 3.4 seconds. It boasts a top speed of 318 km/h. For proponents of pure unadulterated driving, the 911 GT3 also offers a six-speed sports manual gearbox. This allows the high-performance 911 to sprint from 0 to 100 km/h in 3.9 seconds and reach a top speed of 320 km/h. The Porsche 911 GT3 delivers motorsport-like performance in a systematic lightweight construction for an unfiltered driving experience. At the heart of the 911 GT3 beats a four-litre flat engine. The extremely high-revving naturally aspirated engine with 368 kW (500 hp) remains virtually unchanged from the thoroughbred 911 GT3 Cup racing car. The redesigned chassis with rear-axle steering and the systematic lightweight construction are specifically tuned to convert the engine power to provide superior driving dynamics. Developed on the same test track and manufactured on the same production line as the racing cars, Porsche’s motorsport technology has once again been incorporated into a road-approved sportscar. However, the appeal of this 911 GT3 does not only lie in its engine and groundbreaking performance, but also in the way it engages its driver to fully explore its potential. The chassis of the new 911 GT3 benefits from Porsche’s motor racing experience and its tuning has been reworked for even better driving dynamics. The 911 GT3 sits around 25 mm lower than the 911 Carrera S. In addition to the further refined basic design, the chassis also boasts superior handling characteristics, thanks in large part to the active rear-axle steering. Depending on the speed, it steers either in the opposite or the same direction as the front wheels, thereby improving the vehicle’s agility and stability. The dynamic engine mounts and the rear differential lock also boost the car’s driving dynamics. There is no doubt that the Porsche 911 GT3 is one of the greatest performance cars of the modern era, and a worthy tribute to Porsche’s illustrious motorsport history. Taking it all a step further is the Porsche Exclusive Manufaktur customisation programme that gives customers a chance to have a Porsche that reflects their personality, one that is truly only their own. Every Porsche has always been customisable according to an owner’s choice, but Porsche Exclusive Manufaktur is now a standalone department responsible for all customisation work conducted by Porsche, including the building of specialised cars. This in-house workshop specialises in bespoke Porsche modifications. The range of services available also includes advising customers, developing special equipment options for each model range and producing limited production runs. Besides allowing owners the chance to fully customise any Porsche to make it unique to themselves, the Porsche Exclusive Manufaktur department prides itself on three important elements - craftsmanship, commitment and the use of only the finest materials. Porsche Exclusive Manufaktur will honour a customer’s choice of colour and interior combination. If a colour is not available in Porsche’s database, the colour will be replicated to its exact detail. The interior too can be customised according to a customer’s preference.